It is well known that the sprites in Warcraft II are pre-rendered, created from 3D models, as was typical for the time. However, their distinct feature is a "cartoon", hand-drawn look which suggests some kind of processing after the models were converted to sprites. I remember reading somewhere that Blizzard used a filter to automate the process. Does anyone know if this is true and/or any details about that? I've asked Hallfiry who is generally an expert on Blizzard history but he told me he did not come across any information on that. If the filter story is not true, I'm assuming that the sprites were edited manually, either by tracing the raw sprites obtained from 3D models or using them as reference for hand-drawn images created from scratch (the latter is probably less likely). MrFlibble wrote: It is well known that the sprites in Warcraft II are pre-rendered, created from 3D models, as was typical for the time. However, their distinct feature is a "cartoon", hand-drawn look which suggests some kind of processing after the models were converted to sprites. I remember reading somewhere that Blizzard used a filter to automate the process. Does anyone know if this is true and/or any details about that? I've asked Hallfiry who is generally an expert on Blizzard history but he told me he did not come across any information on that. That's a good question. I honestly have never heard of them having used a filter, it would be very interesting if true. Have you tried asking this on other forums? Andrettin wrote: Have you tried asking this on other forums? Not yet. The main problem is, I can't remember where I read about the filter in the first place. They certainly must have used something to post-process the sprites in any case. MrFlibble wrote: Not yet. The main problem is, I can't remember where I read about the filter in the first place. They certainly must have used something to post-process the sprites in any case. Yes, that's true. But it would be interesting to learn that such a process can be automated rather than be done by hand. I also wonder if they had to create the models with converting them to "cartoonish" sprites in mind or not. Andrettin wrote: But it would be interesting to learn that such a process can be automated rather than be done by hand. Hallfiry told me that, according to his studies, Blizzard had used software by Autodesk back then, which may or may not have involved graphics processing tools that were used to create sprites for Warcraft II. (I'm sorry I have to relate anything by Hallfiry, it's just that for some reason he can't sign up here - he can't get the activation e-mail to any of his accounts, including a GMail one). Andrettin wrote: I also wonder if they had to create the models with converting them to "cartoonish" sprites in mind or not. Well, maybe not cartoonish, but perhaps they aimed at a hand-drawn style either as continuation of the first game's style, or to conform with the concept art. Besides, many pre-rendered sprites from the mid-90s have this "plastic" look, especially if it's humans or other living beings. Perhaps Blizzard wanted to avoid that. Then again, Diablo doesn't seem to use any sprite post-processing similar to Warcraft II and is pretty standard compared to many contemporaries (e.g. Fallout) in this respect. Maybe this was done for the atmosphere, to give Warcraft II a lighter "fairy tale" mood. Maybe the entire design initially leaned towards this kind of art style? On another note, maybe someone of the developers should be contacted on this. I'm assuming that Chris Metzen is generally pretty busy but it could be worth a try. Besides, some of the Blizzard devs published their memories of the production of Warcraft and StarCraft. Perhaps they'd be willing to share info too. Maybe I should sign up in the official forums. MrFlibble wrote: Hallfiry told me that, according to his studies, Blizzard had used software by Autodesk back then, which may or may not have involved graphics processing tools that were used to create sprites for Warcraft II. Ah yes, I've seen those. They don't seem to me to differ much in style (per se) from the final WC2 icons, but rather in quality. Maybe they were intended as placeholders from the first? Or the artists were still getting the hang of making higher-resolution icons with a new palette. He worked as designer in many of the early Blizzard games, and he has a blog series there about the making of Warcraft 1 (sadly he hasn't written much about the making of Warcraft 2). He seems like an approachable person. MrFlibble wrote: =. However, their distinct feature is a "cartoon", hand-drawn look which suggests some kind of processing after the models were converted to sprites. I'm pretty sure I've read an article by blizzard devs that mentioned pixel artists drawing over the pre-rendered sprites. The sprites are obvious pixelart and no filter can achieve that level of quality. There are some line-art cleaning algorithms, but they don't know about fine details, like the precise size of items and inter-frame consistency. Tilesets are pixelart too, although some tiles appear to be drawn/sketched using continuous brush, before being retouched by pixel artists. Because they have just too many colors. So the only way to create sprites of such quality is to make a 3d model then hire staff of artists to improve it. Oh yes, I was referring to his posts about Warcraft and StarCraft development. Maybe I should really try contacting him. snv wrote: I'm pretty sure I've read an article by blizzard devs that mentioned pixel artists drawing over the pre-rendered sprites. The sprites are obvious pixelart and no filter can achieve that level of quality. There are some line-art cleaning algorithms, but they don't know about fine details, like the precise size of items and inter-frame consistency. Any idea where you could possibly read that? Was it a gaming magazine or an online publication? 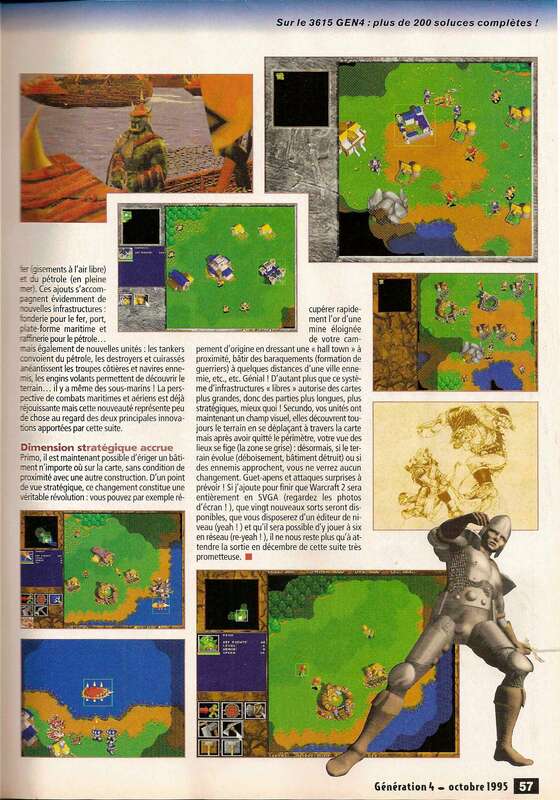 BTW, this magazine scan shows a rare pre-release screenshot (probably a mock-up?) with Human buildings that are raw pre-rendered sprites with no post-processing. Strangely enough, everything else is normally processed sprites similar to those found in the final release. Perhaps Blizzard experimented with different styles. Those 3D-ish buildings could look fine if other graphics matched them. MrFlibble wrote: Any idea where you could possibly read that? Was it a gaming magazine or an online publication? That was long time ago. But IIRC, that was something like a survey article about sprite creation methods.